See below for a quick explanation of this visual. The football team pages show all the key statisitics for a team on a single page. The college football pages evaluate offense and defense by yards per play adjusted for schedule and further break this down into passing and rushing. For the NFL, passing matters much more than rushing, so yards per pass attempt appear as the primary offense and defense statistic. For more on this, check out this article on the insignificance of rushing in the NFL. to convert this win probability into a predicted margin of victory, click on the team to make the prediction appear above the team rankings. When I prep for radio and podcast appearances, I pull up these visuals to get an instant snapshot of both the predictions and match ups. However, the most useful aspect of the team visual are the match up stats. To understand how this works, consider this visual for rushing in the 2012 national title game between Alabama and Notre Dame. 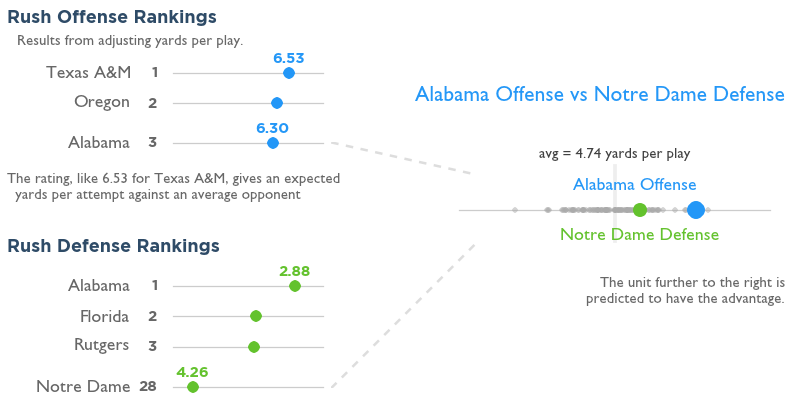 Match up visual for Notre Dame and Alabama before the 2012 title game. Better defenses that allow fewer yards appear further to the right. This facilitates comparisons when the defense is shown next to the offense. The better unit appears further to the right, such as Alabama’s offense. In the new visual, the defense appears on the same line as the offense. To see this, click on an opponent in the schedule above. You’re really looking at how a unit’s statistics deviate from average, so it makes sense to put both units on the same line. The team pages let you instantly evaluate a football game. To become a member of The Power Rank, click here.